Harvard University Press, 9780674390775, 320pp. For most of the nineteenth century, a wide variety of expressive forms--Shakespearean drama, opera, orchestral music, painting and sculpture, as well as the writings of such authors as Dickens and Longfellow--enjoyed both high cultural status and mass popularity. In the nineteenth century Americans (in addition to whatever specific ethnic, class, and regional cultures they were part of) shared a public culture less hierarchically organized, less fragmented into relatively rigid adjectival groupings than their descendants were to experience. By the twentieth century this cultural eclecticism and openness became increasingly rare. Cultural space was more sharply defined and less flexible than it had been. The theater, once a microcosm of America--housing both the entire spectrum of the population and the complete range of entertainment from tragedy to farce, juggling to ballet, opera to minstrelsy--now fragmented into discrete spaces catering to distinct audiences and separate genres of expressive culture. The same transition occurred in concert halls, opera houses, and museums. A growing chasm between "serious" and "popular," between "high" and "low" culture came to dominate America's expressive arts. 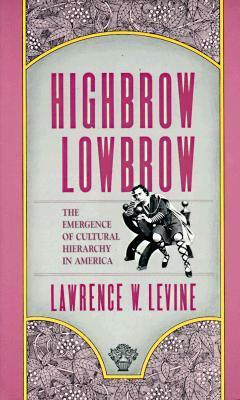 "If there is a tragedy in this development," Levine comments, "it is not only that millions of Americans were now separated from exposure to such creators as Shakespeare, Beethoven, and Verdi, whom they had enjoyed in various formats for much of the nineteenth century, but also that the rigid cultural categories, once they were in place, made it so difficult for so long for so many to understand the value and importance of the popular art forms that were all around them. Too many of those who considered themselves educated and cultured lost for a significant period--and many have still not regained--their ability to discriminate independently, to sort things out for themselves and understand that simply because a form of expressive culture was widely accessible and highly popular it was not therefore necessarily devoid of any redeeming value or artistic merit."